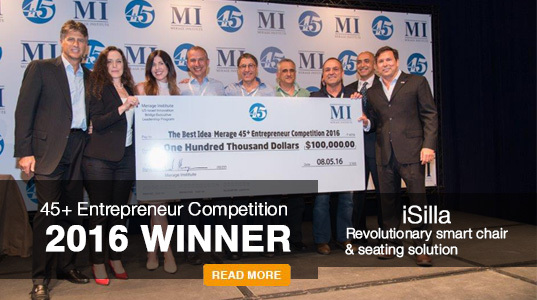 Helping and supporting Israeli entrepreneurs above the age of 45 or women at any age to get significant exposure, recognition and funding that they need. 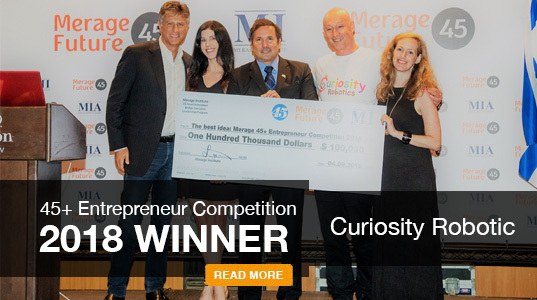 The Merage 45+ invites entrepreneurs with innovative ideas to a unique program with a 100K$ grant for the leading startup. Do you want to win 100,000? Press play. Stage 2 - Mandatory Workshops: 2 full days of workshops including basic business plan writing followed by sessions on an introduction to presentation skills, storytelling and more. Stage 4 - The Final Competition (During Sept 2019): The 5 finalists will present their project to a Board of Judges and to the audience (5 minutes presentation each), followed by Q&A with the judges. The winner will be determined by the judges and audience (Merage Fellows, investors, advisors); the finalist with the highest score will win the first prize ($100,000 USD). First Prize: $ 100,000 - (a) one hundred thousand US dollars to be used for the initial financing of the winning project according to the business plan. 1. Competitors age 45 and over - If a group of entrepreneurs is involved then at least one entrepreneur meets this condition. 3. The competing projects – joint venture/ applied research idea/ innovative technology has viable commercial potential. 4. The project has not been awarded financing in the past (whether self-financed or by a third party) in an amount exceeding $100,000 (one hundred thousand US dollars). 5. Ownership of the project belongs to the competing entrepreneur/s (thus the competition is not suitable for employees of universities/ research institutes/ civil servants, etc. if the intellectual property of the project belongs to their employers). A declaration to this effect is to be made as part of the registration form. 6. Completion and filing of all the documents and terms of registration - For the registration documents. - click here. 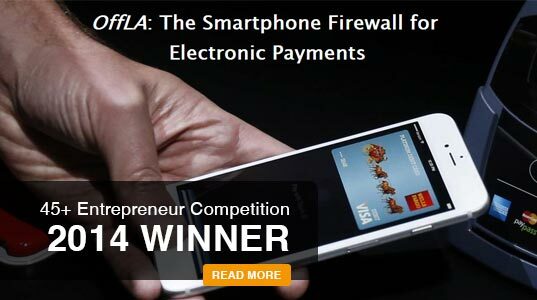 First prize of the winner - $100,000 (to be used for the initial finance of the business plan). The three projects receiving the highest scores will be granted with a right to participate in the prestigious Merage Innovation Bridge Business Leadership program in California (all program related expenses in California are covered flights are excluded). A supportive framework for the preparation of a business plan with the participation of the best experts in the relevant fields and professional advisers. Exposure of various projects both at the mentoring stage and on the competition day, to important entities such as the venture capital industry, investors, strategic partners, customers. The competitors will participate in seminars and workshops provided by experts, with respect to commercial promotion of the projects and the preparation of a business plan. For the seminars - click here. Registration for the competition must be completed by this date. Congratulations to our 5 finalists who did an outstanding job in the competition! We sincerely applaud each of you who took the time to submit your amazing ideas; the submissions exceeded all expectations. 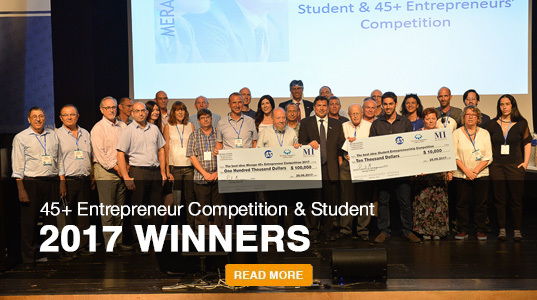 The idea of this competition was to stimulate the Entrepreneurial Spirit, regardless of age. Because of all of you, the competition was a huge success! 2. MindsEye - Provides assistance in diagnosis and monitoring of ADHD and other mental disorders using Pupillometry Biomarkers. Ophir Atar, Anat Barnea, Boaz Brill, Sam Zatelman. 3. Append Medical - Developing a device to prevent stroke. Dr. Leonid Sternik, Oded Meiri, Zachi Berger. TrekAce - a patented wearable tactile monitor, packed with applications and technologies, that transforms traditional forms of communication into intuitive tactile language. Ronen Gabbay, Eliaz Hashdi, Tamir Konortov, Nir Dafni. Pension Compass - Online information system that provides customers actual monetary saving by constantly monitoring their status in reaction to changes in their working and personal life. Abrahan Zvi Barak, Gad Shavit, Orit Nir, Yitzhak Dvir. cMeSafe - innovative autonomous personal safety solution that wholly independently identifies when a user is encountering a distressful situation and automatically calls for help. Dr. Gideon Meiry. Congratulations to our 6 finalists who did an outstanding job in the competition! 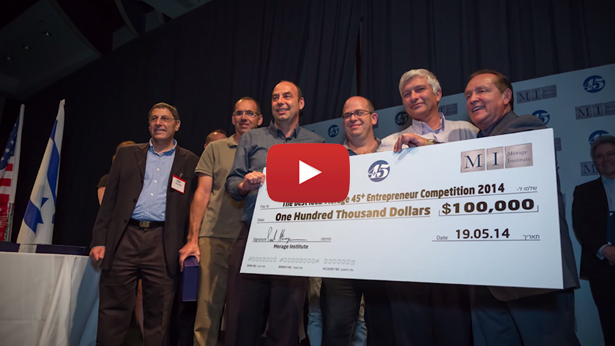 The Merage Institute’s vision is to promoting trade and bridging Innovation between US and Israel as a vehicle to economic growth in Israel and the United States. 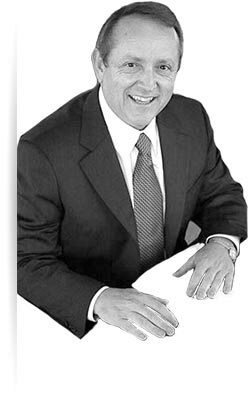 The Institute accomplishes this through a number of innovative initiatives, including specialized Business Leadership Programs for industries that are innovation driven from Israel, where the Institute tries to bridge technologies, research, ideas that can leverage the US and Israel’s biggest advantage – Innovation and by bringing them closer to create economy growth for US and Israel and the rest of the world. At the same time the Institute exposes the US business community to Israeli start-up leaders and vice versa, aiming to strengthen and promote bonding, knowledge exchange and strategic collaborations between the two. The flag activity, Innovation Bridge Business Leadership Program, consists of an intense two week immersion seminar (for about 20 entrepreneurs) which emphasizes effective approaches to marketing, negotiation, networking and sales strategies, finance, legal and procurement issues in the conduct of business with and within the United States. The program is offered completely with no charge of any kind.